In Costa Mesa, California, a 57-year-old former real estate agent, was caught with a mummified corpse of a woman in the passenger’s seat of her 1997 Mercury Marquis. The police are trying to discover the female corpse’s identity. All they know is that she was a transient from the Fountain Valley area, known to the driver as Signe. Police estimate that Signe had been dead for three to ten months due to the amount of decomposition and mummification. Her body only weighed 30 pounds when she was discovered. Police officials are studying her DNA and dental records to discover her identity. After finding the body inside her car, the former real estate agent was afraid to report the dead body to the police. However, she wasn’t too afraid to continue to use the car while the dead body sat covered in clothes in the passenger’s seat. Last Monday, the police were notified that the car was partially blocking a driveway at the 2000 block of Tustin Avenue. When the police arrived at the scene, they immediately noticed an odd smell coming from the car. There’s a surprise. When they noticed a leg underneath a pile of clothing, they broke a window to gain access to the vehicle. Apparently, the smell of the decaying body must have eye-watering to say the least. Officers found a box of baking soda that the driver used to dissipate the smell, but later confessed that she eventually got used to the smell. To make matters worse, if that was possible, the smell-of-death permeated car isn’t hers, it’s her fathers. He loaned her the car because she fell on hard times. Somehow I bet he lets her keep the car, and never loans her a vehicle ever again. I can only imagine the smell, flies and the horrible vision of decay that this former real estate agent must have seen. I bet her father is not in a hurry to get his car back so this loaner may last her for years. Of course, if she starts selling real estate again, I’d give it a good washing before she starts driving buyers around to look at houses. Okay, I’ll go ahead and say it. WHAT WAS SHE THINKING??!!??!!?? Maybe Really Rotten Realty should hire her to take care of our really rotten clients, or at least our “really rotting” clients. If the corpse can’t “fog a mirror” then how does this agent expect her to qualify for a home? 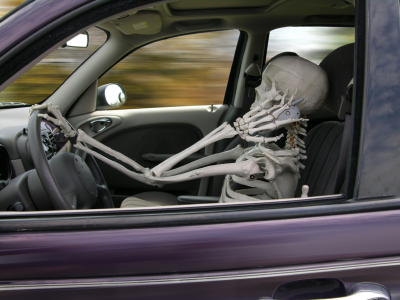 Driving with a corpse in the passenger seat does permit you to use the carpool lanes. That’s probably why she kept the body for so long. This entry was posted in Agents Behaving Badly, Funny Stories, Real Estate Horror Stories and tagged car, dead body, real estate agent by Bill Petrey, Realtor. Bookmark the permalink. Perhaps she was going for the Addams family market segment where gruesome is awesome! Or better yet, since houses aren’t selling, maybe she was driving her around helping her decide which burial plot to purchase. Instead of a zero-lot residence, it’s a zero-plot residence, or a subterranean single-wide mobile home. You really have to examine the thought process of this woman to think it’s okay to drive around with a corpse rather than reporting it to the authorities. I’d hate to be the next chauffeured buyer who had to ride in that smelly car to go house shopping. That is just disgusting! Indeed, what was she thinking!? I can’t even stand the smell of a dead rat! How much more a larger creature like a human being!